We're living in a networked society and ecosystems are popping up like mushrooms. Business ecosystems are created to build competitive advantage around new technology or business innovations and to satisfy ever-increasing customer expectations. Being an ecosystem player is a strategic choice, however, and you need to play by different rules and attitudes. Your success is dependent on the success of other stakeholders, which requires a different level of trust. You need to evolve from a competitive position to partnership mode and to share value within the ecosystem - while keeping the end customer in mind. Quite a spider’s web to navigate. Customer experience and Net Promoter Score (NPS) is high on the agenda of many corporate leadership teams but managing and developing customer experience systematically is a demanding task for many. There's often no clear common understanding of what really drives customer satisfaction and what cause-and-effect relationships affect end-to-end customer experience, loyalty and customer value in a multichannel environment. There's often a flood of data from various sources but filtering meaningful data is difficult. Employees in a siloed organization don't necessarily see how their individual daily contribution is influencing overall customer experience. This makes it difficult to ensure common direction and inspire customer-driven culture change. 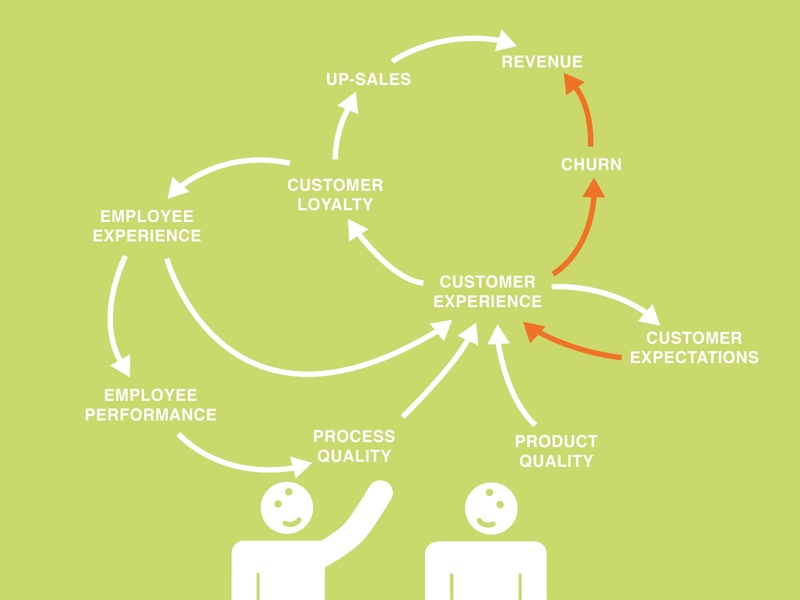 Add to the equation other stakeholders - large corporations, start-ups or in some cases other consumers, and it's even more difficult to ensure uniform customer experience at the ecosystem level. From the customer's point of view, it's his or her individual situational experience that matters, and the ecosystem presents a single brand towards the customer - regardless of which system partner provides the experience. At its best, an ecosystem can exceed customer expectations by providing a platform for wider selection of services and superior seamless experiences that feel tailor-made and well-timed. Digital technologies and platforms, such as the Internet of Things, can play an important role as enablers in enriching the customer's journey and tracking the value created throughout the ecosystem. But applying technology doesn't necessarily take the human factor into consideration, nor does it help drive a common direction, information flow and ecosystem culture. How can an entire customer experience ecosystems breathe at the same pace and pursue a common direction? On top of customer insight, developing a partnership insight should be a new mandatory competence for all ecosystem players. Just like at the individual company level, everyone should understand their role and importance within ecosystem value creation and what drives its power balance. This requires trust, transparency and open communication. Based on a mutual understanding of how value is created and accumulated within the ecosystem, it's possible to set common targets and agree leading indicators and metrics that allow all ecosystem players to proactively advance toward common goals and use a common language. Create superior customer experience and business performance with Qentinel Touch. Book a demo here. Pia Tapio who works as a Director in services at Qentinel Group is a business development professional with curious mind and passion for business and service design thinking and supporting companies to lead and develop customer experience systematically based on customer and business value.